However, after this illegitimacy was obviously flassed by Reddit users, the app name changed to “Dual Whatsweb Update” and the Res-icon was also switched. 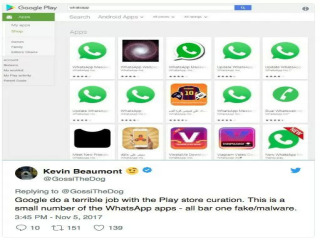 Unlike many other fake apps, the sole aim of the developer was to create revenue through Ad views. You can see the amount of WhatsApp branded apps that have got past Google’s curation below on screenshot. Android users becareful with the way you download things out there, we all know Google playstore is the best secured store for downloading apps but things still happen or you can just get yourself an iPhone and be secured.